Nissan 370Z Review: The new 2009 370Z looks to the past and to the future in delivering an exciting, yet affordable driving experience. “This exciting new Z represents the essence of the Nissan brand, just as the original 240Z did nearly 40 years before,” says Al Castignetti, vice president and general manager, Nissan Division, Nissan North America, Inc.
After its introduction, the original Z grew, culminating in the 1990s’ 300ZX, a handsome but heavy boulevardier. 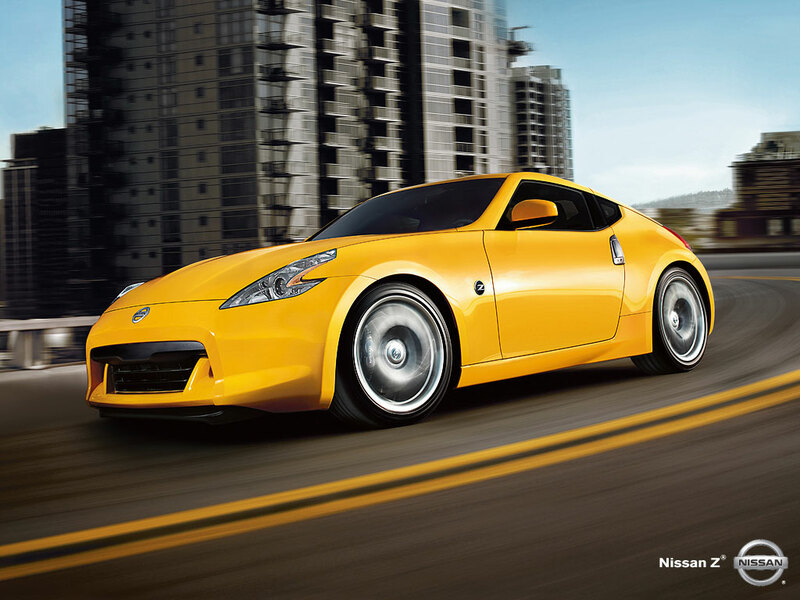 Nissan retired the Z, but went back to its origins with the trim 350Z of 2003. The freshly drawn 2009 Z improves on this car in a multitude of ways. It’s more powerful, but lighter too, thanks to a new engine and many weight-saving actions. The 3.7-liter V6 puts out 332 horsepower, 26 more than its 3.5-liter predecessor, and torque is a strong 270 lb.- ft.
You can get a six-speed manual or a new 7-speed automatic transmission. Fuel economy is 18 mpg City and 26mpg Highway for both the manual and automatic transmissions, increases of 1 mpg City and 2 mpg Highway for the automatic and 1 mpg Highway for the manual transmission, versus the 2008 350Z. The EPA Green Vehicle Guide gives the 370Z a 7 for Air Pollution (good) and a 5 for Greenhouse Gas (average). The new Z now weighs less, thanks to extensive use of aluminum. For example, the fuel tank weight was reduced by 13.9 pounds, the exhaust system by 3.8 pounds and the 19-inch wheels by approximately seven pounds each for the fronts, and six pounds for the rears. These efforts removed a whopping 225 pounds in all. The new car looks very much like a Z, but all new at the same time. The upward curve of the tiny rear side window actually resembles the ’70 more than the ’03 did. Rear visibility remains poor, unfortunately. I parked my Pearl White tester next to a white previous-generation car and the differences stood out. In the old car, the bottom line of the windows went directly to the top edge of the taillamps. In the ’09, the top window line runs back and cuts an elliptical slice out of the boomerang-shaped taillamps. The carved-up light theme is echoed in the headlamps as well. In back, the new model flaunts a larger, trapezoidal license plate area and sporty twin exhaust cutouts. Up front, the new grille cutout features fangs from the Z’s mighty sibling, the GT-R. Inside, it’s fresh and historical, with the main gauges on a pod that moves up and down with the steering wheel. Small circular oil pressure, voltmeter, and clock dials poke out of the center top of the dash. Like everything else in the car, these look familiar, but the styling has been enhanced. The new three-spoke steering wheel features baseball-stitched leather. The leather shift knob has been carefully analyzed and padded differently for more accurate shifts and more comfort. The well-bolstered seats, which are different for driver and passenger, have been reconfigured. It’s obvious that the design team spent lots of time evaluating and improving every aspect of the car. They even relocated the rear strut brace that used to bisect the cargo area, making it easier to carry things. With abundant power, close-fitting seats and a rewarding six-speed manual, I looked for back roads where I could wring the car out a little, more-or-less, legally. It’s there where the Z’s mission shines true. Climbing in and out of the low slung car is annoying when you’re out running errands in town, but on the open road there’s a lot of joy in this car. The 370Z Coupe lineup is simpler now, just the regular, Touring and NISMO models. The Touring adds upgraded, power-adjustable heated seats of synthetic suede and leather, a 6-CD Bose audio system with eight speakers including dual subwoofers, XM® Satellite Radio, Bluetooth®, the HomeLink® Universal Transceiver and a passenger seat map pocket. The NISMO, from Nissan’s sport division, slightly improves engine performance and tunes the suspension and exhaust, adds a front strut brace and body dampers, and outside, installs a body kit and extra light 19-inch alloys. Inside, there’s the signature trim to distinguish it. The 370Z and Touring models can be ordered with the Sport package, which features body mods, including front and rear spoilers. You also get the The SynchroRev Match™ function for the manual six-speed transmission, which blips the throttle for you automatically when shifting to the next gear, smoothing out any up or down shifts. The price of my tester included one option, $115 carpeted floor mats, came to a surprisingly and reasonable $30,740. The Touring model starts at $34,460 and the NISMO begins at $39,130. Plus add $720 to each price for shipping. In a nutshell, this is the best Z, ever. The Bottom Line: From the 1970 Datsun 240Z up to today’s Nissan 370Z all four sports car traits have been retained. Nimble, Fast, Fun and Affordable. These are the 4 corner stones of the sports car market, and the 370Z takes them all to a new level of acceptability. After nearly 40 years of building Z’s, Nissan has smoothed out the wrinkles and added just the right amount of power and function, for the price. Serious sports car buyers should put the 370Z on their short list of “ Cars I must test drive before I Buy “, as this new Z will surprise you.